Drum Covers For Open Head and Closed Head 55 Gallon Drums. 55 Gallon Plastic Drum Lids allow you to prevent contamination of the contents of your drums. They also allow for outside storage of your drums without worry of water entering the drum. 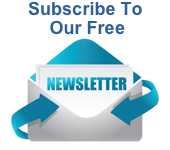 These oil drum covers are available for open head or closed head 55 gallon drums. Item A1666E (picture 1 above) is for closed head drums. This 23" cover fits most 55 gallon drums. Snaps on. Item A1667E (picture 2 above) is for open drums. A 24" cover molded to fit the fastener of most 55 gallon drums. Easily snaps on for a secure fit. 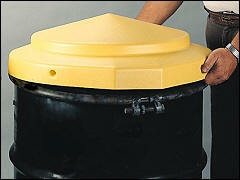 These oil drum covers are made of durable polyethylene that is chemical resistant. Will not crack or split when covering or uncovering a drum. Rigid snap on design. Dome shaped to prevent water and other contaminants from collection on the top of the cover. These oil drum covers are inexpensive and handy to have on hand for when you need them. Please note that 55 gallon drum covers ship UPS over-size. 100% high density polyethylene Dimensions and weights for each product noted below in Description. Drum Cover - 55 gal, Dimensions - 24"x5"
Thank You for Shopping AbsorbentsOnline.com!